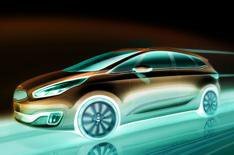 Join us for 2013 Kia Carens preview | What Car? Fancy being one of the first people in the world to see the all-new Kia Carens? We're inviting four readers to join us at a private viewing of the compact MPV a full 10 days before its global launch at the Paris Motor Show. So far we've only seen teaser images of the car, which will come in five and seven-seat versions. You'll be among the first to see it with the wraps off. Will the new Carens live up to Kia's promise of stylish, spacious practicality? Here's your chance to find out, and deliver your verdict before the rest of the world has even laid eyes on it. If you're free for an early start on Monday, September 17, 2012 to join the What Car? Reader Test Team at Kia's European design centre in Frankfurt, get in touch now. If you're selected, we'll also need you to send us your passport details.